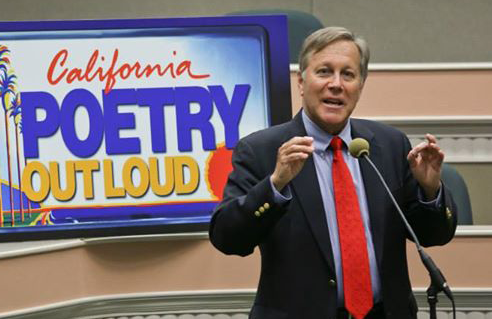 Gioia said that he hasn’t decided on a specific project yet, but he’s toying with the idea of visiting the 44 counties that promote the California Poetry Out Loud program, which he spearheaded during his time as chairman of the National Endowment for the Arts. The program encourages high school students to compete in reciting poetry, exposing them both to creative expression as well as public speaking. See the information below about the upcoming Poetry Out Loud Competition on February 15 where Gioia will be one of the special guests. Second, Iris Jamahl Dunkle was formally installed at the ninth Sonoma County Poet Laureate at a reception Sunday at the Sebastopol Center for the Arts. 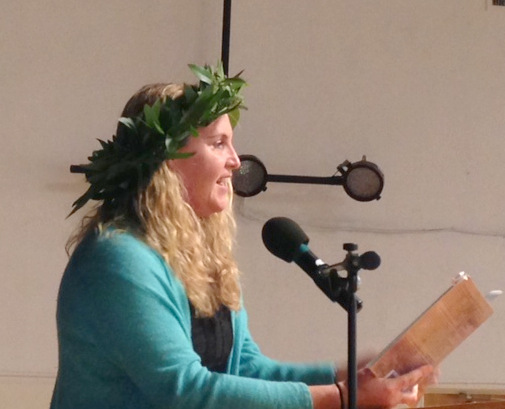 Katherine Hastings did the honors of crowning Iris with her laurel wreath and giving her a warm, gracious, and insightful introduction; Iris then read from her newest publication, There’s a Ghost in the Machine of Air. Iris will be giving a number of readings locally (check the calendar page for details), including a reading with former Poet Laureate Mike Tuggle at Occidental Center for the Arts on Friday, February 5. Check the Poet Laureate News page for Iris’s monthly updates, and check out her feature called “Poet’s Corner,” which will appear bi-weekly in the Press Democrat. Mark your calendars for Monday, February 15, 6:30-9:00 PM for the annual Poetry Out Loud Competition, featuring winners of Sonoma County high school contests in oral poetry recitation. The event will be held once again at the Glaser Center, 547 Mendocino Ave., Santa Rosa. Dana Gioia will be one of the special guests. The annual Healdsburg Literary Guild-sponsored Poetry Valentine will be held at the Healdsburg Regional Library, Center and Piper Streets, in the Forum Room on Wednesday, February 10, 6:00-8:00 p.m. The event is free, and open to the public. This annual festival of love-poetry and chocolates, the Guild’s literary love-gift to the community, will feature the love-poems of 21 poets, whose poems will appear in a chapbook, Textures of Love, published by the Guild for this occasion, and available for purchase at the event. For more information, see February’s Calendar of Events. For an experience of poetry, passion, live music, and dervish dancing performed in the ecstatic tradition, join Rumi’s Caravan on Saturday, February 6 at the Glaser Center in Santa Rosa. The first event is at 2 PM “An Afternoon Delight” (tickets $25); the evening program ,“Rumi by Night ($35) begins at 7 PM. Tickets can be purchased at Many Rivers Books and through Brown Paper Tickets: www.brownpapertickets.com/events/2473190. The event benefits The Center for Climate Protection. For more information, check this link: www.rumiscaravan.com/events. Farewell to Two Great Souls! Last month, we lost two stellar figures in the literary world: CD Wright and Francisco Alarcon. C.D. Wright was born in the Ozark Mountains of Arkansas, the daughter of a judge and a court reporter. She published over a dozen books, most recently ShallCross (2016). Wright’s writing has been described as experimental, Southern, socially conscious, and elliptical. Though her work is deeply connected to the Ozarks, Wright spent significant periods in New York and San Francisco before moving in 1983 to Rhode Island, where she taught at Brown University. With her husband, poet Forrest Gander, she founded and ran Lost Roads Press for over 20 years. A prolific writer for adults and children, Francisco X. Alarcón was born in California and grew up in Guadalajara, Mexico. Alarcón returned to the United States to attend California State University at Long Beach, and he earned his MA from Stanford University. His most recent collection is Canto hondo/Deep Song (2015). Latino and gay identity, mythology, the Nahuatl language, Mesoamerican history, and American culture are all portrayed in Alarcón’s writing. Snake Poems: An Aztec Invocation became a source for many of my own lessons, especially for the California Poets in the Schools. Suzanne Matson, reviewing the book in the Harvard Review, commented: “Alarcón foretells a new American poetics—an all-encompassing ‘eco-poetics’ in which a common language of the elements, plants, and animals is recited and celebrated.” Alarcon taught for many years at UC Davis, and was a special guest at Petaluma’s El Dia de los Muertos Poetry of Remembrance Community reading. He was also a generous supporter of writers and, among his many volunteer services, he was an advisor to Sixteen Rivers Press. He will be greatly missed. On the subject of love, and in tribute to CD Wright and Francisco Alarcon, here are poems by each. Francisco X. Alarcón, from “Of Dark Love” from From the Other Side of Night/Del otro lado de la noche. Copyright © 2002 by Francisco X. Alarcón. Reprinted by permission of University of Arizona Press. C. D. Wright, “Everything Good between Men and Women” from Steal Away: New and Selected Poems. Copyright © 2002 by C. D. Wright. Reprinted with the permission of Copper Canyon Press, P. O. Box 271, Port Townsend, WA 98368-0271, www.coppercanyonpress.org.